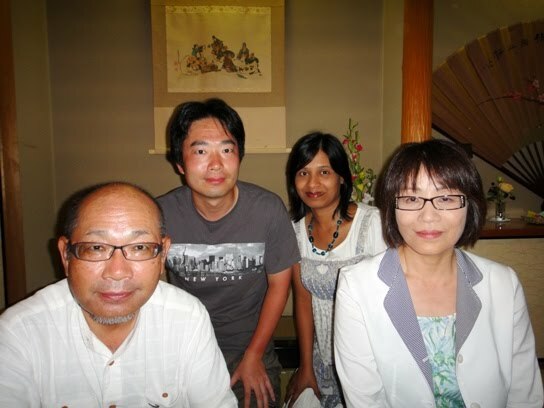 As I wrote in the previous post, on 15th July hubby and I visited Cape Omazaki in Aomori prefecture. 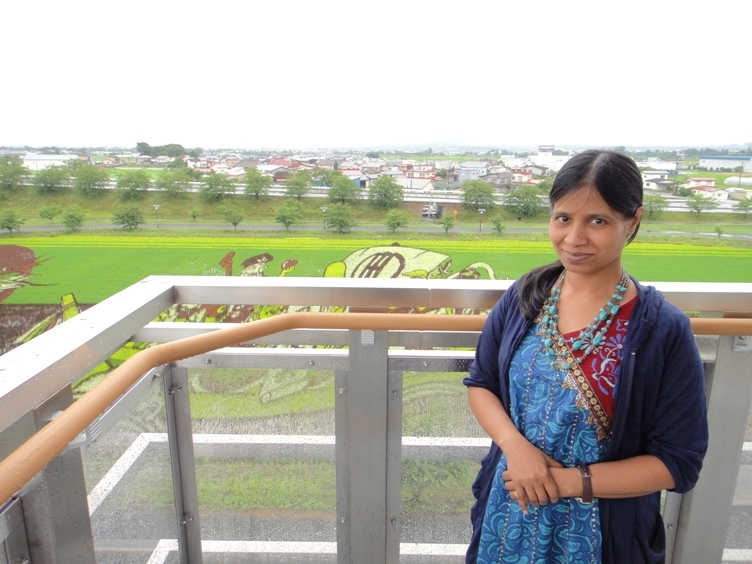 That night we stayed at a hotel in Aomori City. 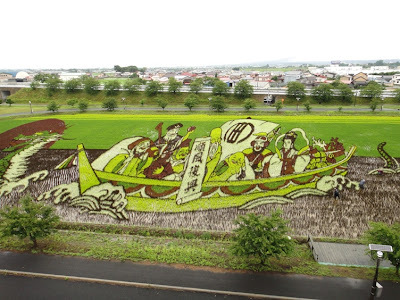 The next morning we went to see rice field artwork in Inakadate Village. 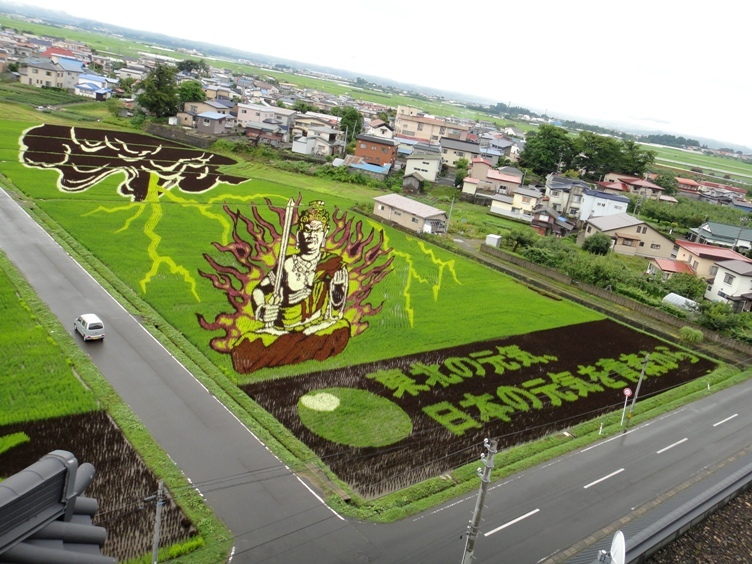 Inakadate village is located in Minamitsugaru district of Aomori prefecture. The tradition of rice field artwork began in 1993 as a way to revitalize the village. The artwork has brought fame and well earned reputation to the village, and every year more than 150000 visitors travel to see the fabulous creations. 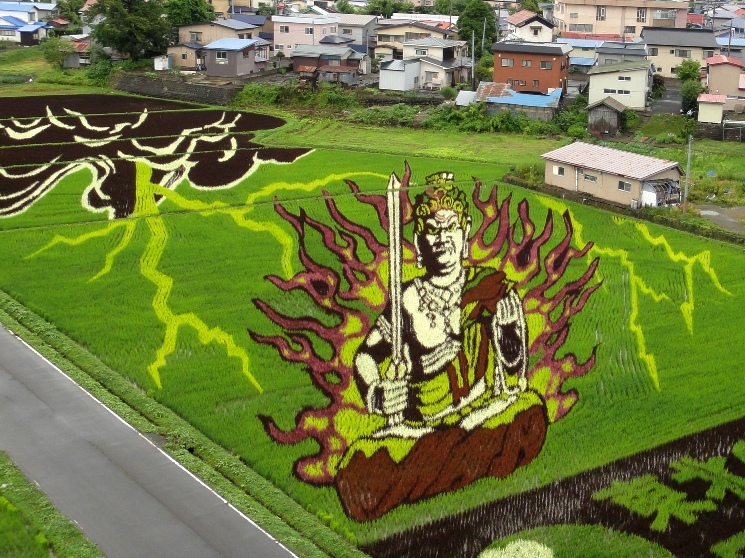 Huge displays of rice field artwork are created by farmers using differently colored rice plant varieties and arranging the plants in precise and strategic manner in the paddy fields. 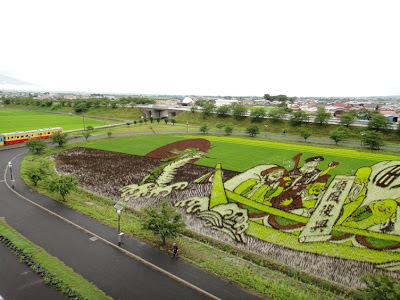 In the first nine years, the farmers grew a simple design of Mount Iwaki every year. But in 2005, a complicated and enormous rice field artwork was created using green, yellow and purple colored rice plants. It should be mentioned that yellow and purple rice plant varieties are common in this area since Edo period. 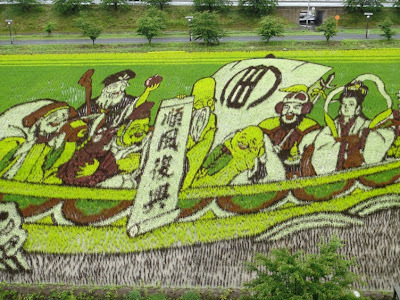 A year later, the planning went high-tech and organizers used computers to precisely plot the planting of differently colored rice varieties. 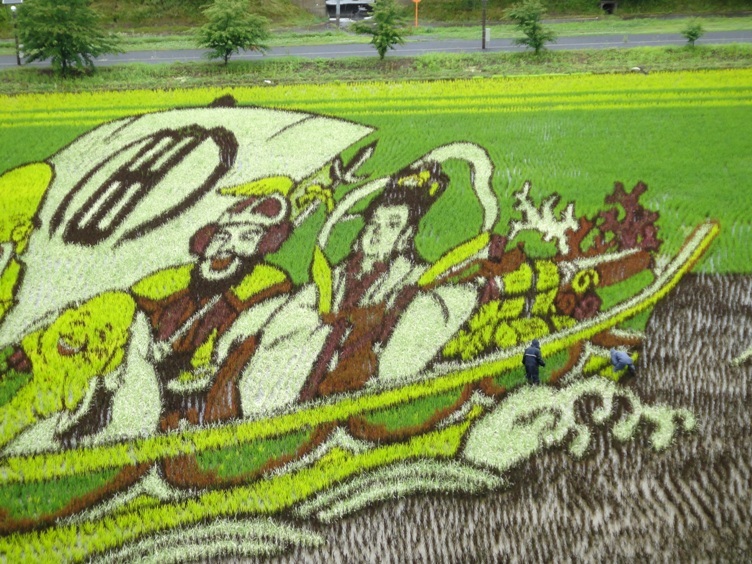 The artwork has evolved into a sophisticated form with increasing addition of diverse colored rice plant varieties and improved techniques for intricate designs. 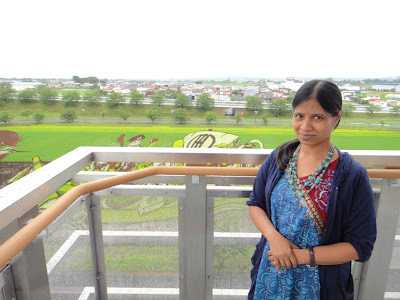 With the assistance of Aomori Prefectural Industrial Technology Research Center (homepage in Japanese), genetically engineered rice plants in red color became available in 2006, white in 2008, and dark green and orange in 2011. 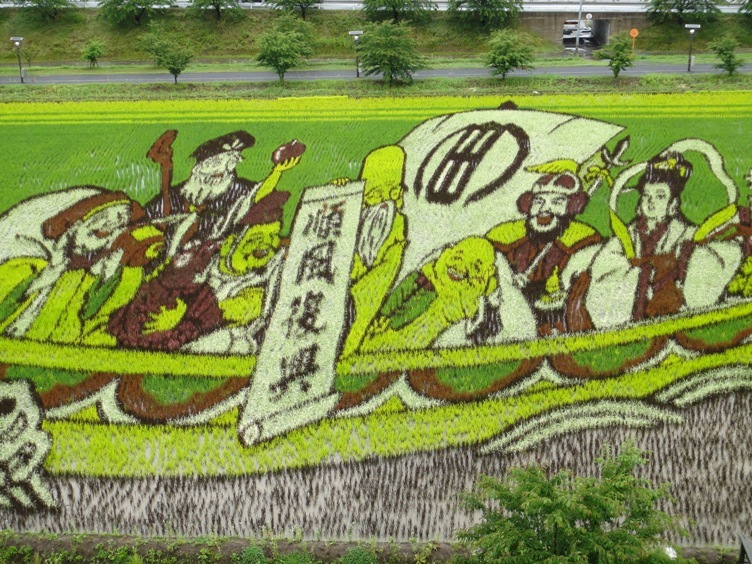 So this year, all the seven rice plant varieties with differently colored leaves have been used to create high quality, sharp, and prefect artwork. 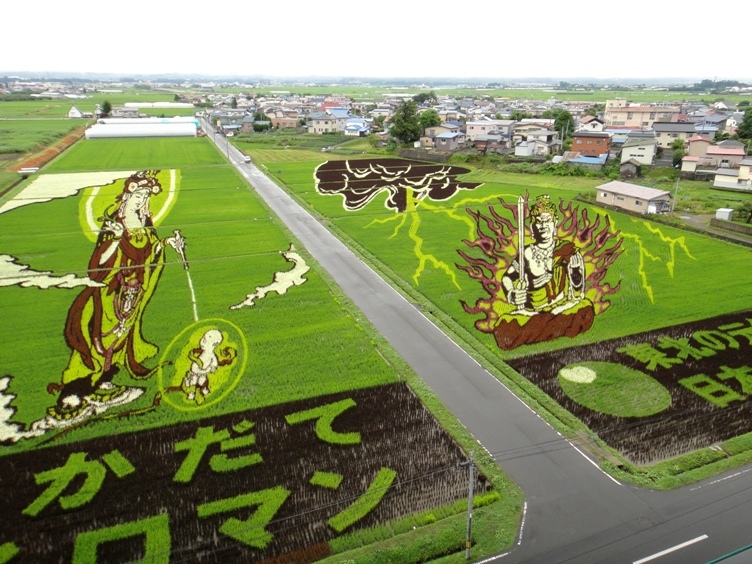 This year, two different rice field artworks have been created, namely Daiichi Tambo Art and Daini Tambo Art. Inakadate Village is located about 43 kilometers southwest of Aomori City and it took us about 50 minutes to reach there by our car. 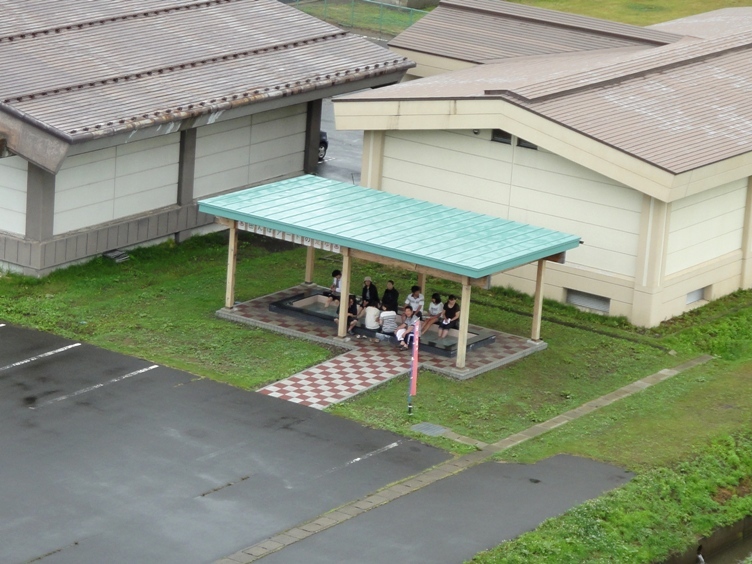 First we went to see the artwork at Daiichi Tambo Art field located behind the Village Hall. 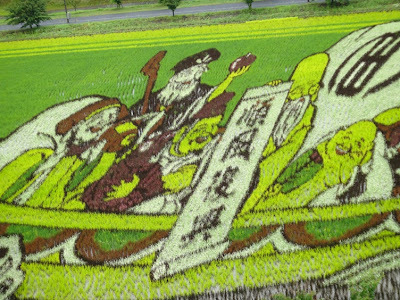 This is the usual rice field where artwork is created every year. The artwork is not visible from ground level. 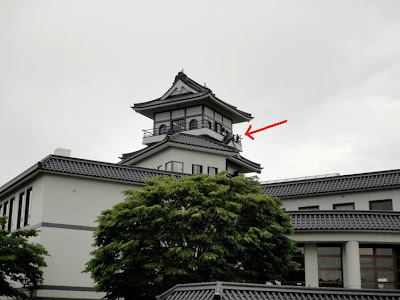 So the Village Hall has been built up into a mock-castle structure 22 meters high, and visitors climb up to the observation deck of the mock-castle to get a perfect view of the artwork. 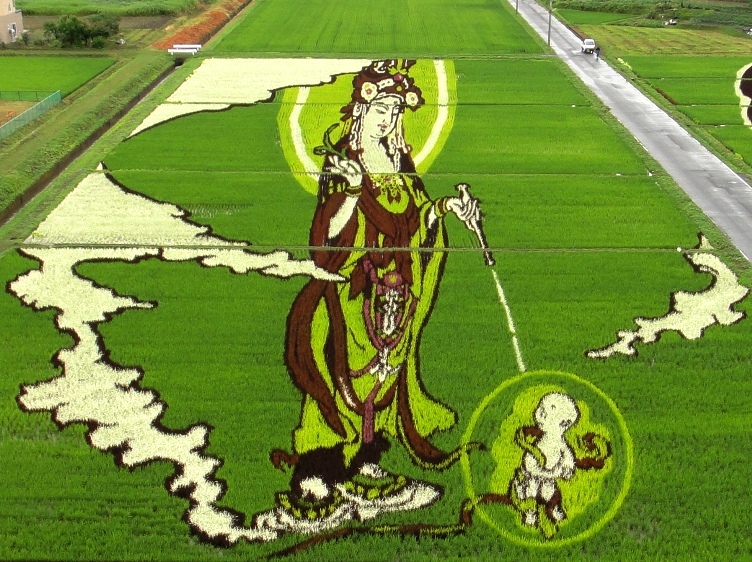 The present high level of sophistication and perfection in the rice field artwork has been achieved due the 2003 artwork subject ‘Mona Lisa’ that marked a major turning point. When seen from the observation deck of the mock-castle, the famous smile of ‘Mona Lisa’ was disproportionately small. 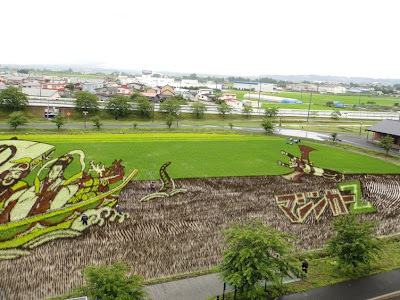 Since then, the rice field artworks have been created so as to look perfect from the observation deck, with the section farthest away made deliberately larger and the nearest smaller. Until last year, entering the mock-castle to view the artwork was free. But from this year, visitors have to pay 200 Yen as admission fee to go to the observation deck of the mock-castle to help finance the 5 million yen project. 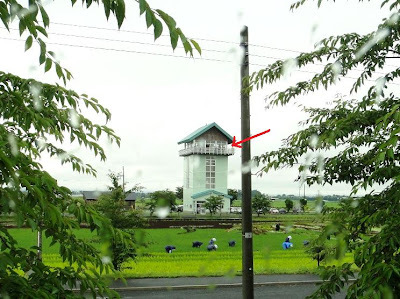 A portion of the mock-castle tower is seen at Inakadate Village Hall. The observation deck is marked by a red arrow. The artwork field is at the backside. 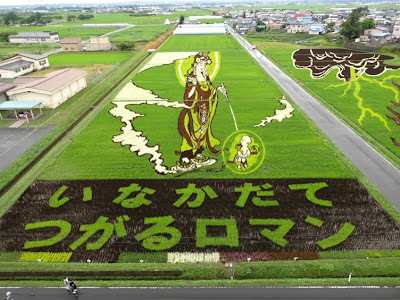 This year in late May, about 1200 volunteers and villagers planted seven different varieties of rice saplings in a pair of paddy fields called Daiichi Tambo adjacent to the Village Hall. The farmers and villagers create the artwork by planting local green-leafed Tsugaru roman rice variety along with yellow-leafed, purple-leafed, red-leafed, white-leafed, dark-green-leafed, and orange-leafed rice plants to create the colored patterns. 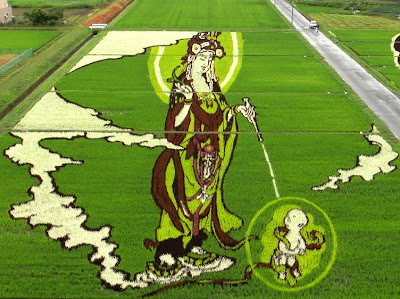 The artwork covers 15000 square meters of rice field. Each year a different design is on show. This year, enormous stunning pictures of the goddess of mercy Hibo Kannon and the god of fire and wisdom Fudo Myoo are created. This artwork can be enjoyed until 29th September this year. 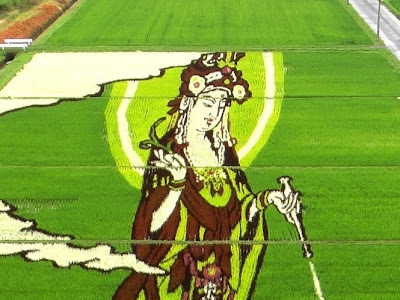 The villagers of Inakadate create artwork by using rice paddies as their canvas and living plants as their paint and brush. On reaching the observation deck of the mock-castle, we looked down and saw a public foot bath called ashiyu where many visitors relaxed by plunging their feet in to the hot water. In front of us on the left side, we saw an extraordinary artwork of the Buddhist goddess of mercy named Hibo Kannon. The artwork shows an affectionate female form of Kannon with a baby nearby looking up at the Kannon. The loving and compassionate facial expressions of Hibo Kannon could be seen so clearly from the observation deck. On the right side of us, we saw another wonderful artwork named Fudo Myoo. Fudo Myoo is a personification of Dainichi Nyorai, and the best known of the Myoo guardian deities, who are venerated especially by the Shingon sect of Esoteric Buddhism. Fudo Myoo converts anger into salvation and is depicted as having a furious glaring face. 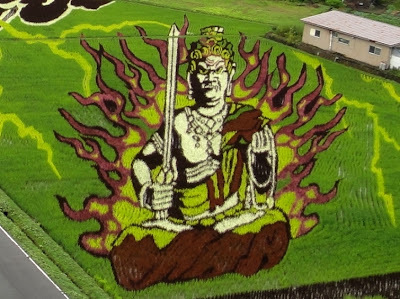 The deity carries kurikara or devil-subduing sword in his right hand and holds rope in left hand to catch and bind up demons. The artwork of Fudo Myoo looked so real and the angry expressions could be clearly seen from the observation deck. We loved seeing the Daiichi Tambo artwork very much as it was very sophisticated, amazing, and fantastic. Next we went to see Daini Tambo Art field, which is located just five minutes drive away by car from Inakadate Village Hall. This rice field artwork has been started from this year, and the Tambo Art field is located at Yayoi no Sato Inakadate Roadside Station. During our drive as we neared the artwork field, we saw an observatory tower and many farmers working in the field. The observatory tower is a newly built very simple structure but it definitely serves its purpose well. 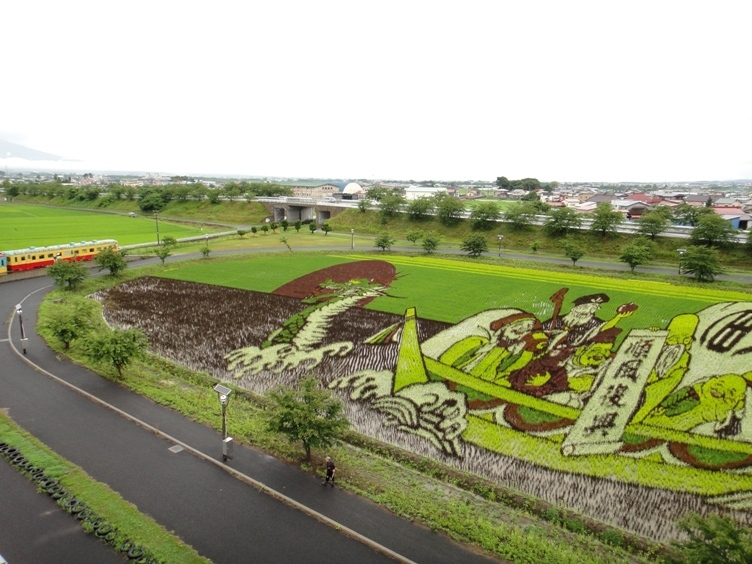 Visitors have to pay 200 Yen as admission fee to go to the observation deck of the observatory to view the rice field artwork. 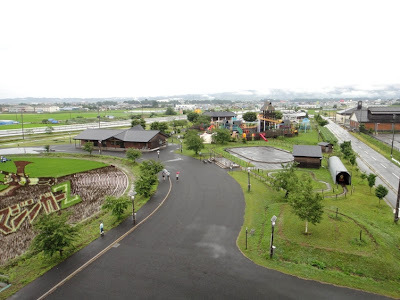 However, we had already purchased special discounted tickets at the mock-castle of the Village Hall where we paid an admission fee of 300 Yen per person to view both the Tambo Art fields. 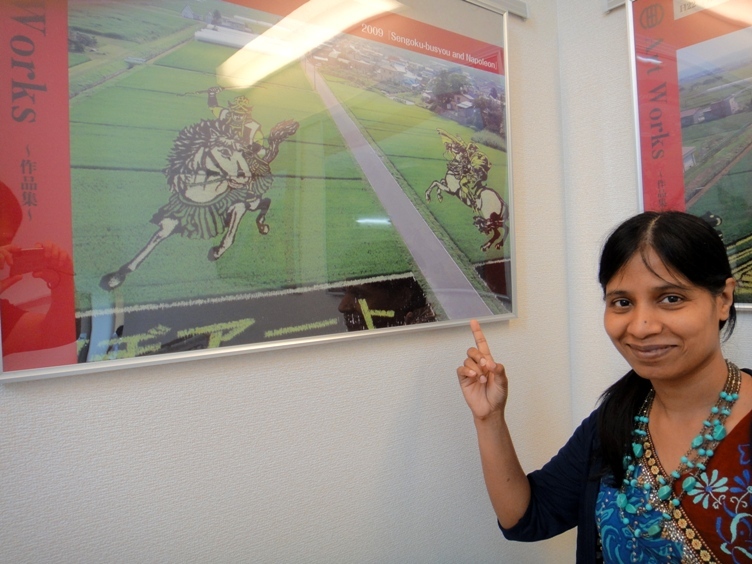 While climbing up the stairs of the observatory, we saw many display panels and photographs of the rice field artwork from the last several years. I was very happy to see a photo of the artwork that we had visited in 2009. From the observation deck, we looked down and saw that the farmers working in the field looked so tiny as compared to the artwork. 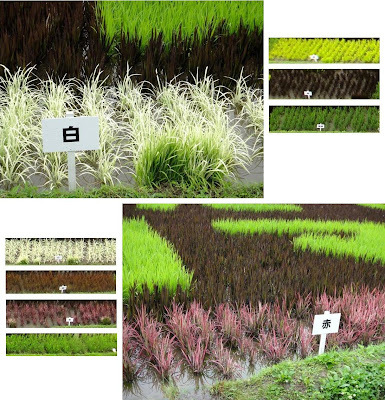 We could clearly see all the seven rice plant varieties with differently colored leaves in the field. I am standing at the observation deck of the tower. 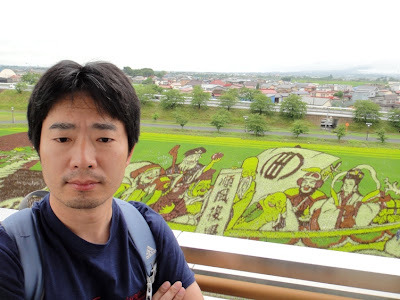 Rice field artwork is partly seen in the background. From the observation deck, we got a perfect view of the enormous stunning artwork named Shichifukujin. Shichifukujin are the seven deities of good fortune in Japanese mythology and folklore. These seven lucky gods are Ebisu, Daikokuten, Bishamonten, Benzaiten, Fukurokuju, Hotei, and Jurojin. These gods travel together in a dragon-headed treasure boat named Takarabune and visit human ports on New Year's Eve to dispense happiness to believers. 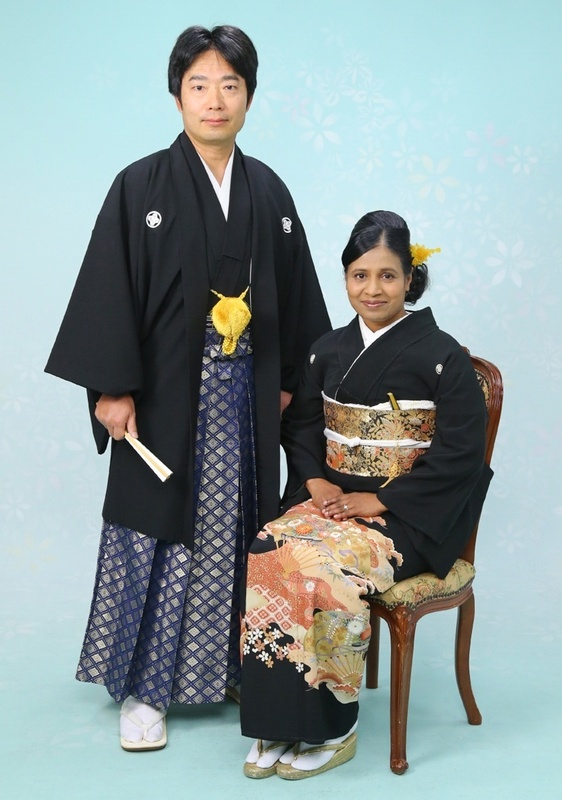 Recently I came to know that Daikokuten, Bishamonten, and Benzaiten gods have Hindu religion equivalents named Shiva, Vishnu, and Saraswati, respectively. The rice field artwork of Shichifukujin on a treasure boat looked amazing and sophisticated. 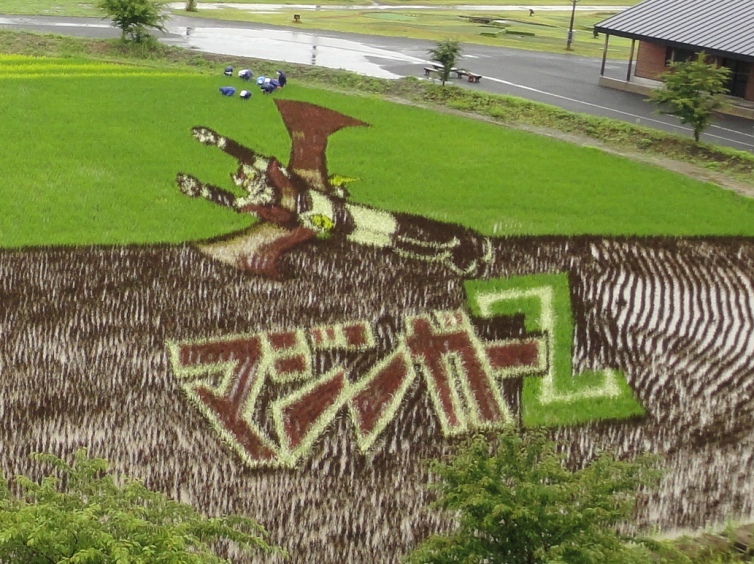 Looking down from the observation deck, to our right we saw another enormous artwork of an anime named super robot Mazinger Z. 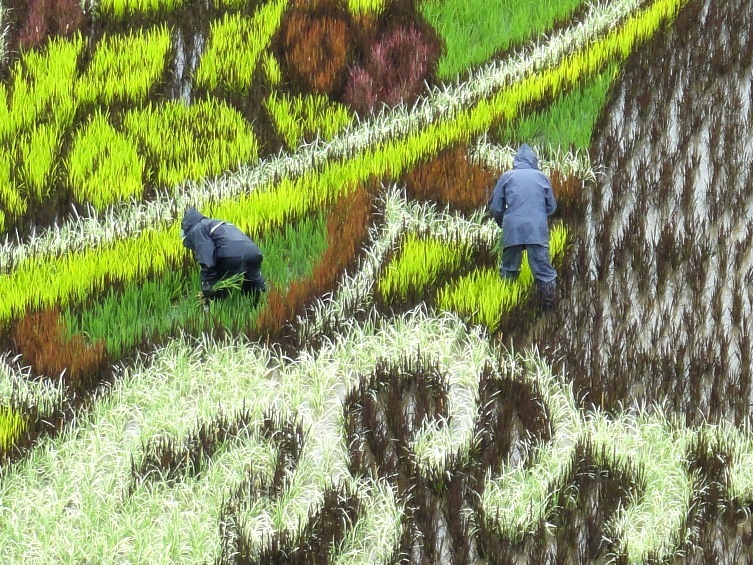 We loved viewing the rice field artwork at Daini Tambo also. This artwork can be enjoyed until 8th October this year. We loved viewing the rice field artwork at Daiichi and Daini Tambo Art fields in Inakadate Village. From Inakadate, it took us about 3.5 hours of car ride to return back home. 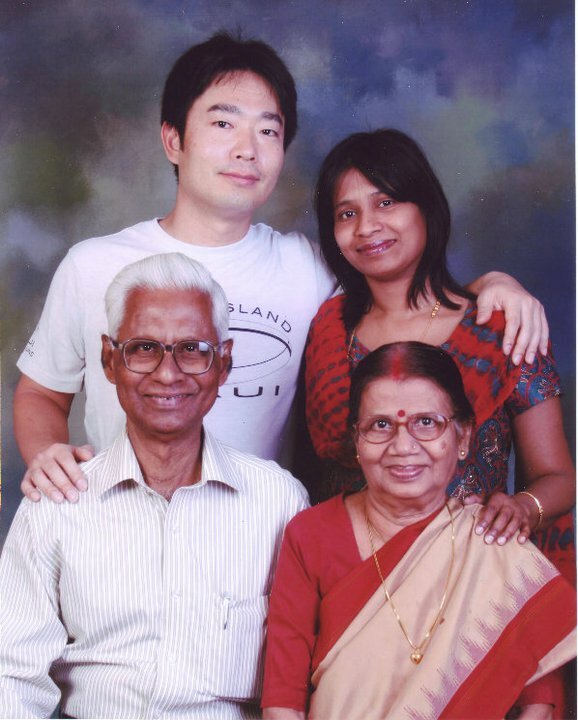 We had a fun filled and memorable three day sightseeing trip. Is there any way that we can buy these variety paddy grains to be used/planted in different country? Thank you for you comment Rifky Husein. I am not sure whether it is possible to buy these paddy grains or not. Please contact the city hall of Inakadate village for correct information.